Update (Sunday August 6, 2017): Congratulations, Jen! You’ve won my giveaway! Please check your email and reply within 48 hours to claim your prize. Thank you to everyone for participating. Stay tuned – I plan to have another fun nail-polish giveaway. Blow out the candles on the cake! Today marks Swatch And Learn’s 7-Year Blogiversary! From now until August 4, 2017, enter for your chance to win the Zoya Wanderlust Collection! 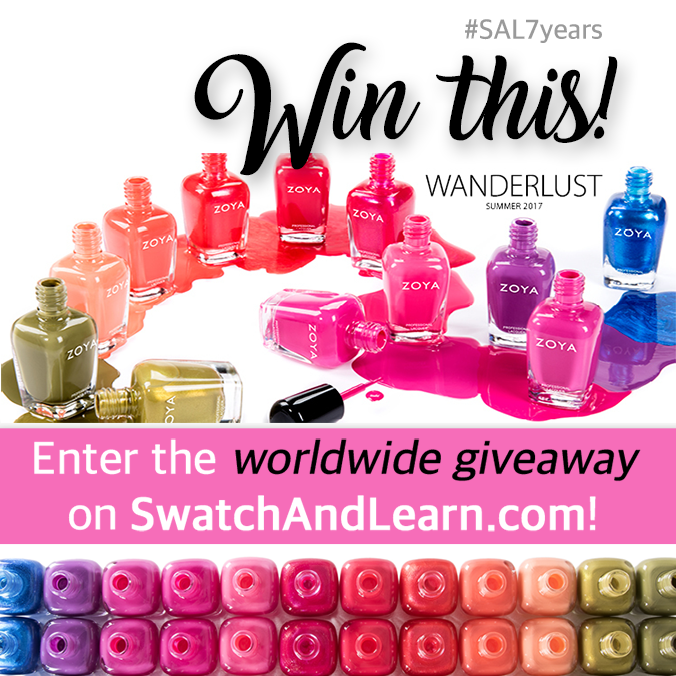 I thought long and hard about which collection I should purchase for the prize, and Zoya Wanderlust won because the formula on each shade is amazing. Also, there’s a nice variety of colours, so I feel that there’d be something for everyone to enjoy. Read the rest of this post for the full details on how you can enter my giveaway. 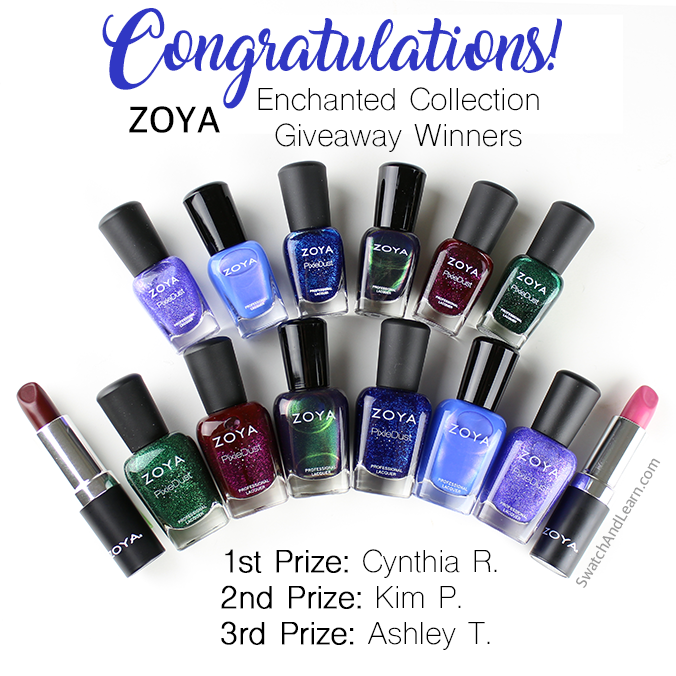 This entry was posted in Giveaways and tagged Zoya, Zoya Wanderlust on July 25, 2017 by Mary S..
Congratulations to the Zoya Enchanted Collection Giveaway Winners! I e-mailed the winners on Tuesday January 3, 2017. You have 48 hours to reply to my e-mail to claim your prize. Failure to do so will force me to choose a new winner. Thank you to everyone for participating in my giveaway! P.S. In case you’d like to see larger photos of my Zoya Enchanted Collection swatches, click the link or the image below. 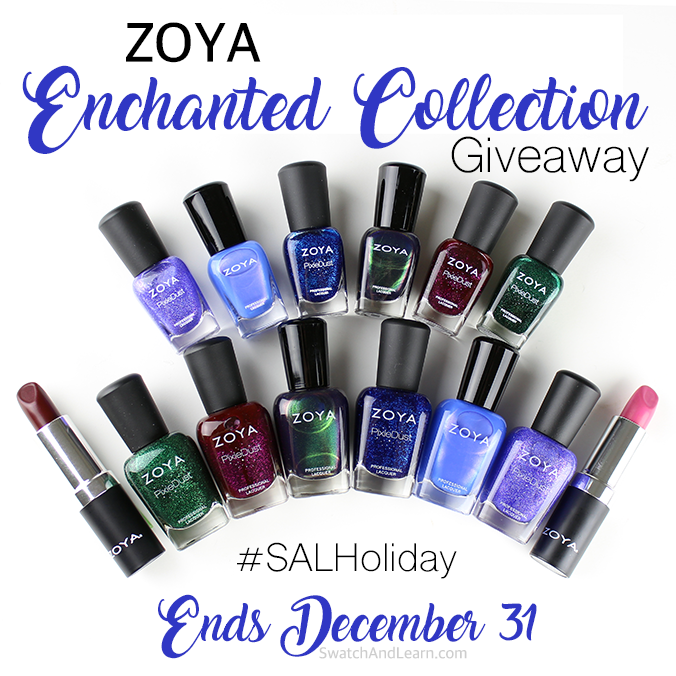 This entry was posted in Giveaways and tagged Zoya on January 3, 2017 by Mary S..
As we draw closer to the end of the year, I’m attempting to bring some holiday cheer your way with a fun Zoya Enchanted Collection Giveaway! I want to give more readers a chance to win these beautiful nail polishes and lipsticks, so this giveaway is open worldwide, and there will be three winners! Hurry – enter by December 31st for your chance to win big! 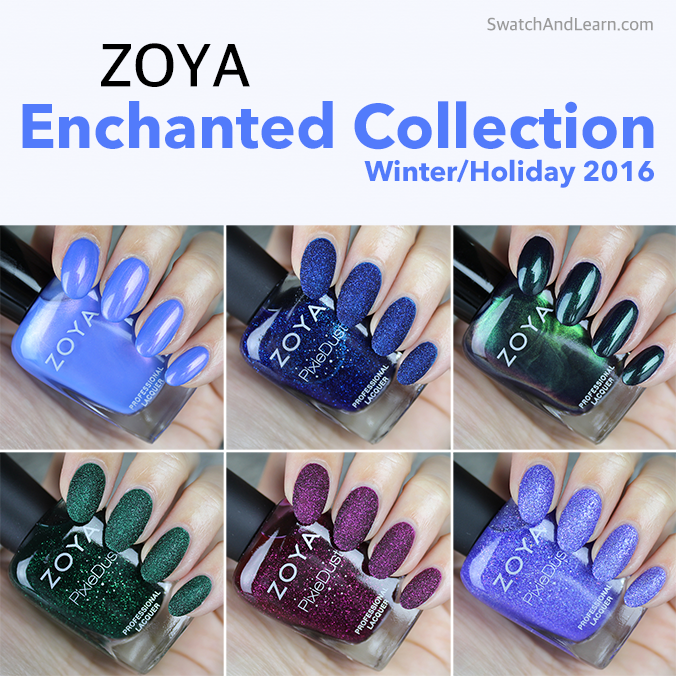 You’ll remember that not long ago, I shared with you my Zoya Enchanted Collection swatches and gushed about how I loved every single colour. This is one of my favourite Zoya collections in quite a while, and I thought it would be the ideal collection to share with readers. That’s why I purchased all these prizes for you. I want to spread my excitement over this collection with you. Can you feel it? And even if you already bought this collection, still consider entering the giveaway because you can share it with a friend who digs nail polish. Not only does the Zoya Enchanted Collection contain beloved textured PixieDusts, but there are also beautiful shimmers. Also…hello, you know that I’m a green nail-polish lover, and the ones in the Zoya Enchanted Collection make my heart beat faster and my nails clasp their hands together, hoping to be painted! 😉 Hope you love them as much as I do! See the rest of this post for the full details on how to enter my giveaway! This entry was posted in Giveaways and tagged Zoya on December 12, 2016 by Mary S..
Last Day to Enter My Worldwide Giveaway! 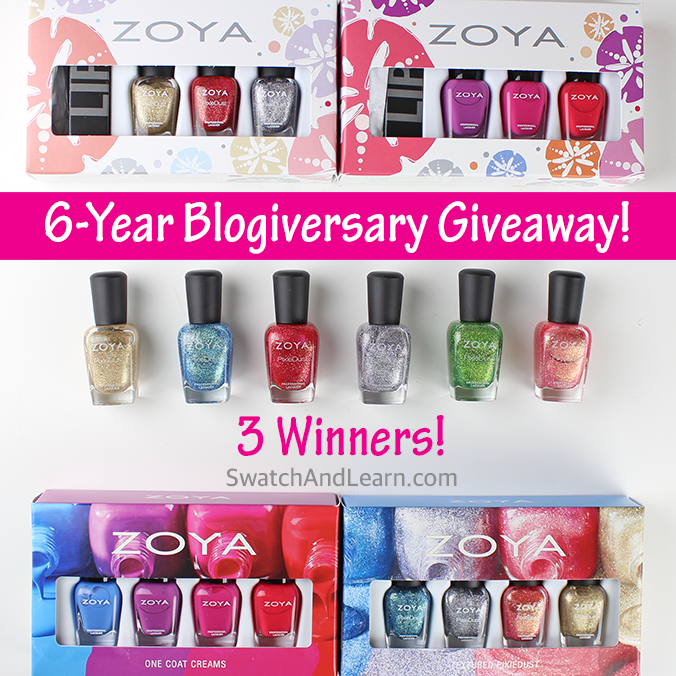 Today’s the LAST DAY to enter my 6-year blogiversary giveaway for your chance to win some beautiful Zoya nail polishes! It’s open worldwide because, although I’m Canadian, my awesome readers span the globe. There will be three lucky winners. Be sure to get your entry in by 11:59 pm EDT. Enter today, and see all the giveaway details! Thank you for the overwhelming support that my awesome readers have given me throughout the years. You have brightened up my day and have made my blogging journey feel nothing short of incredible. A blog is a one-way megaphone without readers! Thanks for making my experience meaningful and insightful. P.S. Tons of swatches of new nail-polish collections are coming in the next day or so. Stay tuned! This entry was posted in Giveaways and tagged Zoya on August 5, 2016 by Mary S..
My blogging journey started in 2010, and back then, I never knew how long this adventure would last or how much I would learn over the years. It has been filled with many exciting milestones, and I’ve gotten to know wonderful readers who never fail to inspire and amuse me. Together, we have grown, and it has been a labour of love sharing one of my passions with you and contributing to the beauty community in a small, but meaningful way. Enter the giveaway by August 5! Earlier, you voted in my poll for which nail-polish collections you wanted as a prize. The Zoya Seashells Collection and the Zoya Sunsets Collection received the most votes. Edit: Congratulations, Jenness! You are the first prize winner! Edit: Congratulations, Allison! You are the second prize winner! Edit: Congratulations, Anouk! You are the third prize winner! A huge thank you to Nail Polish Canada and Zoya for providing the prizes and also for their continual support. These are two companies that I love and highly recommend! To see swatches of all the nail polishes and lipsticks and/or to get further information on the collection, see the links later in this post that will take you to my reviews. Edit (July 26, 2016): I’ve been going through the comments that you’ve left me on this post, and it makes my eyes water. My readers are amazing! Thank you so much for all of your kind words. You brighten up my day and remind me how fortunate I am to have supportive and positive readers! Edit (August 7, 2016): Congratulations to the three winners, Jenness, Allison, and Anouk! Please check your e-mail soon to claim your prizes. Thanks to everyone for participating in this giveaway! Stay tuned because there’s always something new and fun on the blog. This entry was posted in Blog News, Giveaways and tagged Zoya on July 25, 2016 by Mary S..
Congratulations, Tammy! You’ve won the giveaway! 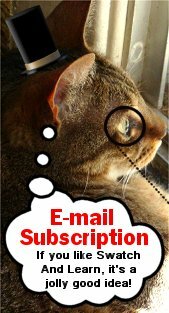 Please reply to my e-mail within 48 hours to claim your prize. 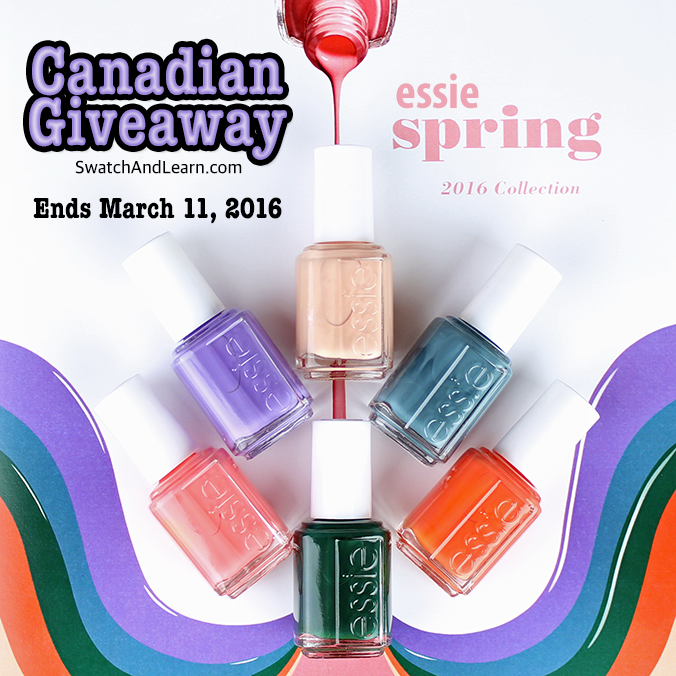 Usher in a new season by entering my Essie Spring 2016 Collection Giveaway exclusively for Canadian readers until Friday March 11, 2016 at 11:59 pm EST! The lucky nail-polish enthusiast who wins this giveaway will receive all six shades in new, full-size bottles: High Class Affair, Lounge Lover, Sunshine State of Mind, Off Tropic, Pool Side Service, and Shades On. I did a preview post with swatches of all the colours in the Essie Spring 2016 Collection, so check that out, if you haven’t already seen it. Also, you can view all the blog posts I’ve done featuring Essie nail polishes here. Carefully read the details further in this post to learn how to submit your valid entry. Also, there are optional ways for you to gain extra entries and increase your chances of winning. This entry was posted in Giveaways and tagged Essie on March 2, 2016 by Mary S..
Justin Bieber Someday is an eau de parfum that was originally released in 2011. It was later sold and is currently under the careful wing of Elizabeth Arden. Nevertheless, I put down my granny cane, adjusted my spectacles, lined up my doilies, and poured myself some Earl Grey tea into a gold-rimmed cup laced with English roses before getting ready to test out this fragrance. Why? I believe that anyone can wear whatever scent they want. “Age is just a number,” said this blogging dinosaur. Even when a fragrance is made for a specific gender, age, or personality, if you feel great wearing it, go for it! Dissolve those unnecessary boundaries. The world has built enough walls. Before we begin the Justin Bieber Someday perfume review, I want you to know where I’m coming from. Generally, I tend to enjoy the sweeter, gourmand eau de parfums, and even those that aren’t necessarily billed as being sweet become that way when interacting with my body chemistry. However, in the past year, I have also started to enjoy more mature, floriental and spicy fragrances. Created by Honorine Blac, the perfumer of Fiermenich, Justin Bieber Someday is classified as a fruity gourmand fragrance. From the description alone, it sounds like something I might like. In this post, you’ll see photos of the bottle and hear my thoughts on what I think of the Justin Bieber Someday perfume. P.S. I’m having a spontaneous surprise: a Justin Bieber Someday 50 mL Eau de Parfum giveaway for a brand new bottle! It’s open to Canadian readers only until this Saturday December 19th, 2015 at 11:59 pm EST. (Scroll to the bottom of this post for the full details and to enter.) Edit (Sunday December 20th, 2015): Congratulations, Rebecca! You’ve won my giveaway! 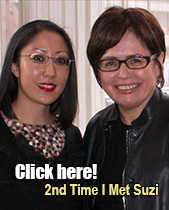 Please check your e-mail shortly and reply to my e-mail within 24 hours to claim your prize! Thanks to everyone for participating, and come back again soon, as I’ll be having nail-polish giveaways. P.P.S. In case you missed it, yesterday evening, I published a blog post on the OPI Hello Kitty Collection launching in January 2016! This entry was posted in Fragrance Reviews, Giveaways, Product Reviews and tagged Elizabeth Arden, Justin Bieber on December 15, 2015 by Mary S..